Welcome back, lovely brunching fans! As Brandy is still in an eggnog induced coma and Bunny has been up in the air more than Santa Claus, today we bring you a collection of delectable recipes from our friends at Rave Review!™ Original Culinary Spirits™. Culinary Spirits are specially crafted for cooking at high temperatures, keeping their flavors better than traditional spirits while decreasing any astringent alcohol bite. They currently come in four varieties: Brandy, Hops, Bourbon, and Rum, all ready to go in convenient 200 ML sized bottles. 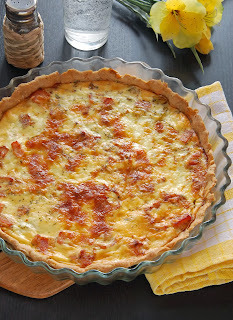 Before passing out in her arm chair for three days straight, Brandy told us that she wanted to have a bacon themed brunch this year on New Year's Day, so we present you all with some delicious bacon themed recipes that we hope will start your 2014 off on a savory and sweet foot (or belly, as the case may be). Part dessert, part side dish, this recipe brings together three of the greatest ingredients on earth! Toffee-coated slabs of boozy bacon! What could be better? In a large sauté pan over med-low heat, render the bacon until it turns very crispy, about 15 minutes. 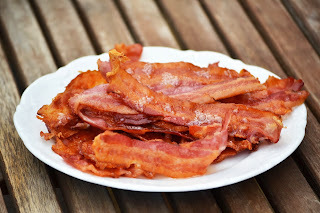 Remove the bacon from the pan with a slotted spoon and set aside, on a plate covered with paper towels. Discard any remaining fat and deglaze the pan with the Rave Review! Original Culinary Bourbon and 2 tbsps. of water. Swirl in the maple syrup, and raise the heat to medium. Bring the syrup to a hard simmer until it reaches 240 degrees, then return the bacon to the pan and coat with syrup. Remove the pan from the heat, and lay bacon out on a non-stick cookie sheet. Let cool to room temperature, then serve. Peel the onions and cut off both ends. Place them in a microwave safe dish with 2 tablespoons of water and cook on high for 2-3 minutes, just until a fork starts to go through them easily. Crisp up the bacon in a large frying pan, set aside to drain, then chop roughly. Slowly add flour to rendered bacon fat and whisk over medium heat until smooth and thick, almost a paste like consistency. Let the flour mixture brown a little in the pan until golden, then add chicken broth and Culinary Brandy. Whisk until smooth and thick. Add cream and continue to whisk. Add chives, cayenne, salt, and black pepper and stir to incorporate. Add onions and cook mixture for another 10 minutes or until onions are completely fork tender. Top with more chives and chopped bacon. Combine all ingredients in a glass and garnish with a piece of crispy bacon, celery stalk, and green bean. This is for all the bacon lovers out there! Chicago's culinary scene is blessed in more ways than one. This city has an incredible variety in it's cuisine choices, it has world renowned master chefs, it has excellent local produce and protein for it's restaurants to choose from, and best of all, Chicago has legions of food bloggers to research, test, capture, and tell it's citizens exactly where all the best goodies can be found so that they aren't left drowning in a sea of take out menus. Obviously, Bunny and Brandy's little corner of the web covers the brunch scene to the best of our abilities, leaving other nooks and crannies to be explored by a lot of other talented writers and food enthusiasts. Luckily enough, there is a website called Chicago Food Bloggers (of which Bunny and Brandy are members), founded by the lovely Mike Kostyo which compiles many of Chicago's most prolific culinary adventurers into one handy database (and for those of you looking for any last minute foodie gifts, here is the official Chicago Food Blogger's Gift Guide, to which Bunny and Brandy made a few contributions). Aside from the Chicago Food Bloggers, Brandy is a member of many exclusive and private clubs (her sewing circle has more secretive guidelines than the Freemasons), but none, perhaps, are as mysterious as the Guild of Dunwich Code Breakers, a society so elite that members have to obtain special ordinances in order to permit more than one of them be present in the same country at any one time. But it was one of these very ordinances that had to be obtained when Brandy learned that the founder of the GoDCB, Baron Von Blackfisk (a very mysterious man with an even more mysterious past) was coming to Chicago. "I simply must take you to brunch with me when you get here!" Brandy wrote to him, using a Caesar Shift Cipher. "I don't know if that would be proper, my sweet," he replied in Morse Code, "What if we were to both perish in some tragic meal time accident? The Guild would never be the same." "Oh, don't be silly," Brandy said, dropping all pretense and resorting to English, "Nothing bad has ever happened to anyone at brunch. Well, except for that one time at Roof..." And with that she made plans for the Baron to tag along with her to the Chicago Food Bloggers brunch at Nellcote in the West Loop. First impressions of Nellcote were breath taking. The ground floor dining area was wide, open, sunny, and opulent with about 20 crystal chandeliers scattered across the ceiling, a gorgeous modern bar at the back, high backed turquoise chairs forming a small lounge area just inside, and marble stairs on either side of the room that lead to a second dining area with bar seating and huge, cushy banquets. "It reminds me of an old European ballroom!" Brandy sighed, "Oh, I danced with many rogues, princes, and rogue princes in rooms like this in my day!" Baron Von Blackfisk tilted his wide brimmed fedora just barely above his eyes and surveyed the room. "I wonder if it's haunted," he mused eagerly. Brandy and the Baron were taken to the top most section of the restaurant and seated at a long banquet table with all of the other bloggers. Having arrived fashionably late (a practice not shared by most of the other bloggers who had arrived early), the duo were seated down at the end of the table along with Brandy's good friend Hawke from The Cider Press and a new friend, Rebecca from Rebeccamendations, who though seemingly perplexed by her eccentric brunching mates, was a delight to chat with about her blogging perspective, having only recently moved to Chicago from Austin, Texas. The delighted bunch were treated to glasses of Prosecco in order to toast with, as well as a few of the Sunny Side Up Pizzas (Nellcote prides themselves on their house made doughs, which are used to make fire grilled flatbreads like this one as well as fresh pastas). The pizzas had a lovely smoky taste to the crisp and chewy crust, which matched nicely with the silky egg topper, the peppery wilted arugula, and the sharp fontina cheese. Brandy and Rebecca also decided to order some of the Rare Tea Cellars teas on offer, with Rebecca opting for the Emperor's Chamomile and Brandy sticking with her favorite, the Regal Earl Grey ("I knew an Earl Grey once," Baron Von Blackfisk commented, "He was a rather quiet little gentlemen. Had a taste for tweed jackets and loose women." "I suspect you're thinking of someone else, deary," Brandy said, rolling her eyes). Both teas came in loose leaf form, contained in their own little pots, which enabled the consumer to watch them blossom and dance as the hot water worked its magic. Rebecca was fascinated by her chamomile, which had a mysteriously citrus note to its scent, and Brandy very much enjoyed her Earl Grey with its rich muskiness and smooth bergamot flair. For his entree, Hawke went for the Lobster Hash, a brilliant combination of expensive ingredients used in a simplistic recipe. Hawke remarked on the beautiful smoked flavor from the paprika spiked Hollandaise which covered the two delicately poached eggs on the top, as well as the clear flavor of good quality olive oil coating the small chunks of Yukon gold potatoes. The lobster was tender and buttery, just as it should be, with its flavor very distinct from, yet harmonious with the rest of the elements in the dish. Baron Von Blackfisk went with the Whole Wheat Citrus Pancakes, which came topped with a whipped yogurt and a cranberry compote ("My sweet tooth is a demanding mistress at times," he told Brandy in a whisper). Upon first bite, the Baron was instantly in love, taking off his fedora for the first time that morning in order to show his reverence for the dish. He compared the taste of the pancakes to the deliciousness of a fried dough, though with a more nutty note from the whole wheat flour. The cranberries and the yogurt matched perfectly in their tart sweetness, balancing the uniquely caramelized flavor of the pancakes quite well. "I will always remember the morning I beheld pancake perfection. No other round of dough will ever compare... I'm ruined forever," the Baron wept. "Oh don't be so dramatic," Brandy grumbled. Brandy, as always, had to get a little sweet and savory into her meal, and so she first order a plate of Pain Perdu ("Otherwise known as French Toast in less fancy circles," she informed the table), which came topped with a caramel creme anglais and diced red apples. The toast, much like the pancakes, was absolute heaven, having been created from house made brioche. The outside had an amazingly even crispness to it, almost like a very thin layer of caramel was coating the bread, while the inside remained pure buttery goodness. The untouched apples helped to cut the richness of the toast as well as the creamy glaze that surrounded it. "I've never had any French toast with a texture quite like this," Brandy commented, "I suppose this deserves its higher title. I would never confuse this for some run of the mill, overly saccharine, soggy diner dish, that's for sure!" To finish off, Brandy ordered the Breakfast Pasta, which consisted of house made spaghetti, bacon, pecorino cheese, and a 1 hour egg (an egg poached so delicately that its yolk and white achieve the same consistency). Breaking the yolk provided the pasta with a rich sauce that complimented the salty cheese incredibly well. The bacon, though in thick chunks, didn't overwhelm the dish with its smokiness and peppery flavor, leaving the true star that was the pasta to shine brightly. The spaghetti was on the thicker side with a lovely rusticness to it, making for some bites that were al dente and others that were a little softer. Brandy was mightily impressed with everything about Nellcote, from their beautiful and charming servers, to the attention to detail in the food, to the perfectly beautiful interior. "Do you think they'd sell me one of those turquoise chairs?" Brandy asked Baron Von Blackfisk as they stood at the marble steps, looking out at the room. "Perhaps. But would you really want to rob them of the whimsy?" he questioned her with a significantly mysterious raise of the eyebrow. "I suppose not," Brandy sighed, "Then maybe the chandeliers? Surely they could part with one of them!" Seasons greetings all of our festive friends! What with all of the silliness of the holidays, Brandy has decided to take it easy on the eating out for a little bit and stay inside, warming her house with the smells of the season and warming her body with the spirits of Christmas past, present, and future (namely gin, whiskey, and vermouth respectively). Luckily, Brandy had a fair few things lying around the house that she very much wanted to experiment with, so please enjoy the fruits of her tinkering below! Please do let us know if you try any of Brandy's concoctions for yourselves by tweeting us at @BunnyandBrandy or posting pictures to our Facebook wall! Brandy didn't deviate too much from this classic dish, only adding fresh mushrooms instead of canned, which creates more of a broth for the spices to melt into and the meat to cook in. Straining out the broth at the end of the cooking process, Brandy boiled it down in a saucepan with just a little cornstarch to really thicken it and intensify the flavor before mixing in the sour cream and pouring it back over the meat, mushrooms, onions, and egg noodles. Brandy also loved mixing the leftovers with some scrambled egg the next morning for a creamy and hearty breakfast! Though never a big fan of beans, Brandy really does enjoy the idea behind chilli, especially on a cold Chicago evening. She used ground turkey for her meat to make the chilli extra lean and substituted the kidney beans the recipe originally called for for some frozen corn. This gave the chilli the same kind of variation in texture one would expect without sacrificing any structure. The Chilli spice packet added just the perfect amount of zing to the dish for Brandy, as her delicate palate can't handle too much heat all at once. This was possibly the easiest of the four dishes to prepare, as all that Brandy did was combine the spice packet with half a bottle of cola flavored soda, which not only helped to tenderize the roast, but also made for a savory and sweet, almost barbecue style sauce. Though the roast was delicious right out of the pot, Brandy also loved putting the tender meat onto rolls the next day and using the sauce for dipping. Never one to be held to conventions, Brandy actually used this one to flavor a gigantic turkey breast, mixing the spice packet with a container of garden vegetable cream cheese and slathering the poultry with it. This method produced not only a succulently juicy turkey, but also a flavorful, creamy gravy that also worked well on a side of mashed potatoes! For dessert, Brandy decided to try something a little different. As a great lover of Christmas cookies, Brandy knew she wanted to bake up a fresh batch of something special, but she also wanted to make sure everyone she offered them to could enjoy them. "There's just so much to take into consideration these days," she grumbled, "Everyone's allergic to everything. No nuts, no gluten, no sugar, no eggs. Next thing you know they're going to be telling you to cook without water!" Without compromising her principals too much, Brandy decided to make an all organic, festive cookie, but challenged herself to make it without refined sugar. 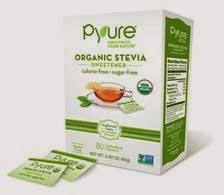 Hearing good things about Pyure Organic Stevia (which is only produced using the highest quality stevia, making sure to carefully extract only the sweetest part of the stevia plant so as to avoid any impurities in the flavor) Brandy chose this as her sweetener. Following a basic sugar cookie recipe (2 sticks of butter, 2 eggs, 2 1/2 cups of flour, 1 tablespoon of baking powder, 1 tablespoon of baking soda, and a pinch of salt) Brandy substituted the usual 2 cups of sugar for 1/3 a cup of Pyure Organic Stevia, then added in chopped green pistachios and pulverized freeze dried strawberries. The texture of the cookies was a little more on the dry side, which made them perfect for dunking into tea (which Brandy also sweetened with some of the Pyure) and the addition of the nuts and berries to the cookies provided a beautiful red and green flecked interior, making them a delightful little seasonal snack. After Bunny's little surprise for her on Thanksgiving, Brandy suddenly found herself with a house full of Portuguese handball players who didn't seem to understand that they'd vastly over stayed their welcome. "Well, what have you been feeding them?" Bunny asked over a crackly phone line (she was deep inside a cave at the time). "Turkey, of course! That's all they want to eat, thanks to you," Brandy moaned. "Well there's your problem!" Bunny laughed, "You need to feed them something else and then they'll know its time to leave. Try some Swedish food." "Swedish food?" "Yes. Their last big defeat was at the hands of the Swedish team, so it will definitely send a message." Not knowing enough about Swedish home cooking to make a convincing meal (and not wanting to trek all the way out to the IKEA in Schaumburg for some frozen meatballs), Brandy did a little bit of research and quickly found out that world famous chef, Top Chef Master, Macy's Culinary Council member, and nice judge on Food Network's Chopped Marcus Samuelsson was giving a demo at Macy's on State Street. Though Marcus was Ethiopian born, he was actually raised by a Swedish family, making his culinary perspective particularly unique. Chef Samuelsson was also at Macy's that day as part of a partnership with the Make a Wish Foundation, granting the wish of one particularly awesome young lady named Sara who had been diagnosed with Non-Hodgkins Lymphoma and wanted nothing more than to be a chef. Chef Samuelsson spent a good part of the morning with her, teaching her various techniques and letting her taste the wears from his burger joint on the seventh floor food court, then had her assist him in his demonstrations by doing a little bit of prep work and helping to hand out food to the crowd. The first dish on the docket was a Couscous Paella with Shrimp. Though not very Swedish in nature, Chef Samuelsson's motive for making a dish like this was more to use holiday leftovers in a creative way. "Did you know we throw out about 40% of our leftovers, especially during the holidays?" he asked the crowd before launching into the recipe, which he said could be adjusted to fit any meats or vegetables one has lying around. His paella had a spicy kick from some mild peppers and a hearty chorizo sausage. By using couscous instead of a traditional rice, Chef Samuelsson added a more interesting creamy texture to the dish as well as making it more international feeling. Next up was his grandmother's recipe for Meatballs. which he suggested serving with a carrot and apple mash. These meatballs were not what Brandy expected at all, as Chef Samuelsson coated them in a sweet barbecue sauce instead of gravy, which matched well with the sweet mash. "You can make mash out of any root vegetables for a nice change of pace," he instructed, "Don't give potatoes all the attention." Lastly was a very simple Korean style Short Rib, which was marinated in honey, soy sauce, and spices over night and then grilled and sliced. Chef Samuelson served the tender slices of beef on leaves of lettuce, which provided a nice contrast of cool crispness to the slightly salty and tender beef. Though initially there to learn how to cook Swedish food, Brandy soon fell in love with Chef Samuelsson's charm and international fusion skills. He liked to emphasize including all of the family in cooking meals and did this by inviting several members of the audience to cook with him during the demo, including one young lady who had just started on the line at fellow Culinary Council member Stephanie Izard's restaurant, Girl and the Goat. Chef Samuelsson also delighted the crowd by telling stories about his culinary adventures, like cooking for President Barack Obama (when asking his mother's advice on the occasion, she told him, "Leave before you mess up.") and asking them to name their least favorite judges on Chopped, then threatening to call said judges to tell them the crowd's opinion. Not sure what to do upon returning home without the Swedish recipes she'd hoped for, Brandy chose to prepare what she had learned anyway, making her handsome young house guests pitch in by rolling meatballs, deveining shrimp, and massaging pieces of short rib. And to her surprise, at the end of the meal, the dear young things began to pack away their things, presented her with a beautiful poinsettia plant, and finally left her house. Confused as to what had happened, Brandy once again called Bunny. "Oh, I know why they left!" Bunny exclaimed, "I told them you would give them a cooking lesson! They must have been waiting all this time for you to show them some recipes!" "Bunny, do me a favor," Brandy sighed, "The next time you send someone to my doorstep, at least make sure they've got a couple of bottles of sherry with them. That way I won't care how long they stay." At this point, Brandy is pretty used to her regular postcards from Bunny, which usually arrive tattered, torn, water marked, and muddy from every mysterious corner of the earth. So when something other than a postcard showed up on her doorstep on the day after Thanksgiving, Brandy was more than a little surprised. Brandy looked up from the flowery stationary upon which the note had been written to see the still smiling faces of the Portuguese Handball team looking at her expectantly. "Turkey?" one of them said, cocking his head to the left like a curious puppy. "Turkey, right, see the thing is," Brandy began, "I didn't make a turkey this year. We had a potluck at the Quilting Society meeting and I was in charge of the green beans and..." But her explanation didn't seem to be making any headway as the young men continued to smile and blink at her. Not sure what else to do, she ushered them all inside her parlor and sat them down around the television set. "Alright, you want a traditional American Thanksgiving? Well first you have to watch Miracle on 34th Street," she said as she flipped on the tiny wood framed screen. Once she was quite sure that her unexpected house guests were occupied, she stealthily collected her coat, hat, and bag, and slipped out the door. "Where on earth am I to find a Thanksgiving dinner?" she grumbled on her way to the train, and after riding the Red Line as far as it would go, she came upon an answer. Having visited Pret A Manger this past summer with Bunny, Brandy knew they had lots of options that would at least be freshly prepared (every Pret a Manger location prepares their wears on sight on a daily basis, donating whatever is left at the end of the day to a local shelter). "Perhaps I can cobble together something," she mused. But once arriving at the Pret in Evanston (there are also several Prets in the Loop and a new one opening up inside Merchandise Mart this week), Brandy was simply delighted to find that they were carrying a whole range of flavorful holiday favorites and treats. Loading her arms full of everything she could find, Brandy headed home to divvy up the treasures just as the Handball boys were finishing their movie. There were three sandwiches to choose from: the Holiday Lunch, the Holiday Cranberry and Goat Cheese, and the Holiday Ham and Fig Chutney. The Holiday Lunch consisted of a mix of traditional Thanksgiving flavors with moist slices of turkey, a crunchy nut roast stuffing, cranberry sauce, and spinach on soft granary bread. Brandy really loved the mix of flavors and textures in this sandwich and especially that the turkey remained the star of the show. The Holiday Cranberry and Goat Cheese turned out to be a vegetarian version of the Holiday Lunch with smooth, creamy goat cheese spread replacing the turkey. Brandy felt that the cranberry was given more room to shine in this sandwich. The Holiday Ham and Fig, which came served on a hearty baguette, provided a more Christmasy contrast with a smokey, tender ham, sweet fig chutney, and crunchy almonds. There was also the Holiday Turkey Dinner Wrap, which came served hot. Sharing a lot of its flavors with the Holiday Lunch, the wrap also included sweet potatoes and crispy onions in addition to the turkey, stuffing, and cranberry sauce. This was probably Brandy's (and three out of the four handball players) favorite, as it combined all the best bits of the sweet and savory side dishes that really define a great holiday meal. For dessert, Brandy had purchased an army of Double Chocolate Peppermint Cookies and Holiday Fig and Almond Yogurt Pots as well as a special coffee concoction, the Gingersnap Latte. The yogurt pots, which had a sensational sweet fig spread on the bottom that could be swirled through the rich Greek yogurt, were also topped with dried cranberries and toasted almond slices. The Double Chocolate Peppermint Cookies were a true rich delight with their soft interior, deep chocolate flavor, and melty white chocolate chunks, which had been ever so slightly kissed with a cool minty essence. They made the perfect combination with the Holiday Gingersnap Latte, which boasted a more subtle sweetness and a nice spicy kick from the ginger. Though it may not have been a typical Thanksgiving meal, the Portuguese Handball Team seemed mighty pleased with their impromptu feast, so much so that they all fell asleep, strewn across the various sofas and chairs in Brandy's parlor. "Well then," Brandy sighed, "I suppose they discovered this little Thanksgiving tradition on their own." The writers of this blog were provided with gift cards from Pret a Manger in order to sample the holiday menu and give an honest review. Happy Black Friday friends! We do hope you are all thoroughly stuffed from your holiday gorging and home safe and warm away from the insanity in the stores. Recently, Brandy was asked by our friends at Bolthouse Farms to sample their limited edition holiday beverages, and as Brandy has been a great fan of their juices and protein smoothies for quite some time ("That Vanilla Chai one is like sipping a spicy slice of heaven," she says) so she was more than delighted to try the three seasonal flavors: Pumpkin Spice Latte, Peppermint Mocha, and Holiday Nog. The Pumpkin Spice Latte was definitely Brandy's favorite of the three. Made with coffee, milk, and real pumpkin puree, Brandy had never tasted any drink quite as authentically pumpkin as this one. Even though there was coffee in the mix, what Brandy tasted was more like a slice of pumpkin pie with hints of cinnamon and nutmeg. The concoction was rich and thick as well, making it an ideal mid morning snack or an indulgent accompaniment to some snickerdoodle cookies. Next was the Peppermint Mocha, another coffee concoction made with premium cocoa powder and real peppermint extract for an authentic minty chill. This mixture was a little thinner than Brandy had expected, but still incredibly flavorful with the rich chocolate hitting the tongue first and the frosty, candy cane like peppermint coming in soon afterwards. Brandy loved that the drink wasn't overly sweetened and that it came loaded with calcium and protein, making it a much healthier alternative to some other coffee house offerings. Lastly was the Holiday Nog, a healthier twist on the traditional Egg Nog. This version wasn't quite the thick, viscus texture Brandy was accustomed to in an eggnog, but a much smoother, more velvety liquid that was perfect for sipping by the fire. Because this version was made with low fat milk and carrot juice ("Carrot juice?!?!" Brandy exclaimed in disbelief upon reading the ingredients list, but was careful not to spit out any of the precious liquid) its actually possible to call this a healthy beverage, which is usually unheard of for anything in the "nog" category. Brandy really loved the warming spices in the Holiday Nog and its creamy, vanilla scented flavor. We do hope you all have the chance to try one, two, or all three of these lovely little mixtures before they are no longer in stores! And if you do have the chance to sample them, make sure to let us know which one is your favorite! Greetings dear readers and a very happy Thanksgiving to one and all from all of us here at Bunny and Brandy's Brunchtime Blog! As Thanksgiving traditionally ushers in the season of giving, we thought we'd take the opportunity to not only give away a brilliant prize to one of our lucky readers, but show everyone a unique way to give gifts yourselves this holiday season! The World Vision Gift Catalog offers more than 250 items that help fight poverty and save lives here in U.S. and around the world. With a financial contribution, donors can select one of the 30+ handcrafted gifts that can be shared with a loved one and at the same time help a person in need. Donors can also choose to send contributions in the form of targeted donations of things like livestock (chickens, goats, rabbits, etc. ), clothing, medicine, and lots of other useful things that can really make a difference to a needy family. And so in the spirit of giving, World Vision has provided Brandy with one of their Fair Trade Coffee Sets, which includes whole bean coffee from Ethiopia, Sumatra, and Costa Rica blended by OneCup.org and is delivered in a bag hand-sewn by local women with a hand-carved olivewood scoop. As an avid coffee drinker, Brandy simply loved this dark, smooth roast. "Every sip was like dressing my tounge in a velvet blanket!" she exclaimed. Good luck friends and a very happy Thanksgiving to you all!